In earlier articles we looked at the way we use “economic exchanges” to simplify complex code into a series of small understandable steps. We use similar ideas to build up business logic in our DBIx::Class model layer: combining multiple small predefined queries together to create more complex conditions for generating SQL queries against the database. Read on below if you take the challenge to read “0011001010” language of our database experts who love to share knowledge with you again about clean code. 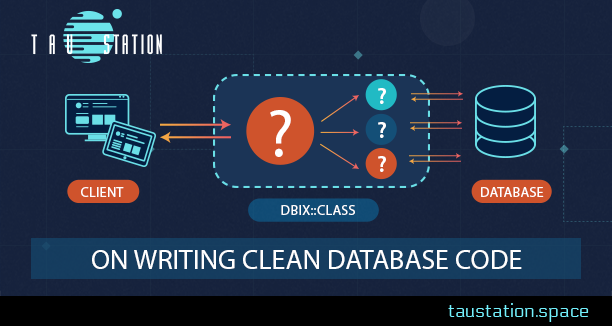 ➔Continue reading "On writing clean database code"
People have been asking about our technology stack, so this post will be a bit “tech heavy.” Further, it will be opinionated tech-heavy. You’ve been warned! When I started Tau Station, I knew that I was primarily looking for a robust Web framework, a flexible ORM (object-relational mapper), and a strong database. Due to my having been heavily involved in open source for years, only open source products were considered. ➔Continue reading "Tau Station’s Tech Stack"